« Day 58 in Beijing: You Can Never Go Home Again. Day 59 in Beijing: A Blast From The Pabst. I took Jill to the local Wu-Mart grocery store here in my neighborhood. We wanted to buy some Chinese beer and Chinese red wine for a taste test that we will do in the next few days. We also noticed some America beers on the shelf. The original Pabst Blue Ribbon and World War II commemorative can. 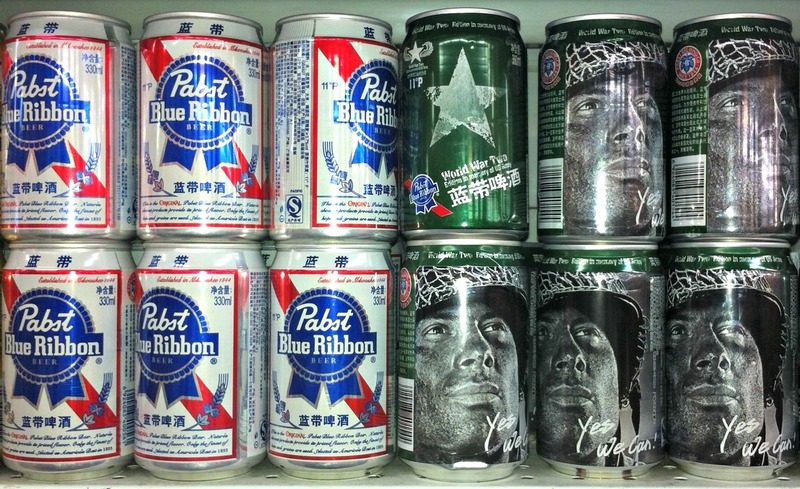 Hipster beer makes it big in Beijing. If this is the best export America has, I feel bad for China. 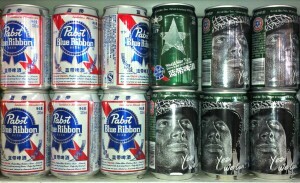 Notice the beer beside the Pabst Blue Ribbon. It is green, emblazoned with a soldier’s face. This is a World War II commemorative Pabst Blue Ribbon can of beer. I have no idea, nor does it say on the can, who this soldier is, what this soldier did, or why this is beer is commemorative of World War II. We found it all very surreal. We choose to buy Chinese beers since we’ve tried Pabst and nothing can be worse that that.